Has it really been more than two months since I have posted? As much as it pains me, I have to be honest: for some reason I just had no desire to write. Admittedly, I have been busy going to two major multi-national exercises, not to mention some pretty significant family stuff going on. With all of that being said, those are just excuses, and I apologize. I promise to get back on the horse now that I have a little more free time. Besides, I could really use some therapeutic writing to get the avgeekiness flowing again. In the meantime, enjoy a little snippet of some of the amazing flying I got to do recently. I will put together some better stuff soon. Of particular note in this video is the runway at the end is actually where the Enola Gay took off from on its historic mission. 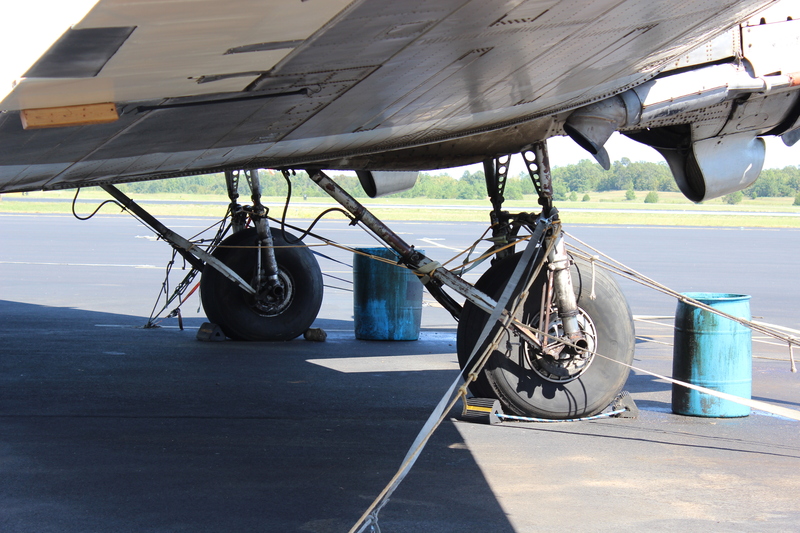 I also think it is awesome to see the propellers go into reverse shortly after we landed. Enjoy. The venerable P-51 Mustang was designed by the German-born Edgar Schmued. I have probably thought more about this article than just about any other article that I have written, and I still am not exactly sure what I want to say so I will start with a little education and see where I end up. For those who may not know exactly where Veterans Day comes from or why we honor it, let me explain it for you. The original holiday was designed to honor those who had died in WWI and was celebrated on November 11 in honor of when the Armistice with Germany went into effect at the 11th hour of the 11th day of the 11th month. Armistice Day is still celebrated in other countries, and is also referred to as Remembrance Day in places like Canada and the UK. After WWII a movement was started by a veteran named Raymond Weeks who thought the holiday should celebrate all veterans, and not just those who died in WWI. In 1954 the Veterans Day that we know was officially established to honor all veterans who have served this great nation. Just to be clear, Memorial Day is to honor those who died in service to the country, while Veterans Day is to celebrate ALL who served. I guess maybe that is the message I want to focus on is that this is a celebration of people. Many people have played many different roles in multiple different wars in the last century. We are often quick to recognize those who died or performed heroic acts, and rightfully so because they made the ultimate sacrifice to ensure our freedom and the freedom of others. They deserve our utmost gratitude and adulation for their actions, and I will never tire of hearing their stories and honoring their example in any way that I can. It is also important to recognize those whose contributions may easily get overlooked. Being the avgeek that I am I think of people like Edgar Schmued, the German-born designer of the P-51 Mustang that had a huge impact on the air war and directly impacted the final outcome of the war. I only recently learned of my Grandma’s involvement in the Navy. 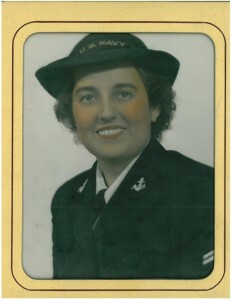 I think of my Grandma who served in the Navy as a clerk in the Brooklyn Shipyard ensuring that parts were getting to where they needed to be. I think of my friend, and fellow Airman, Joe Kaelin who comes from a family of military members that have served for over 70 years including 32 years consecutively. I think of my dad who served in the Army in both tanks and helicopters; which ultimately inspired my love of airplanes and my own military service. I think of standing on the yellow footprints at MCRD San Diego 11 years ago and ultimately crossing the parade deck with 214 other young men. Sadly, I have little contact with many of them now but it is not unreasonable to think some of them have paid the ultimate sacrifice, or at least been wounded defending our freedom. I think of the young men and women I had the opportunity to support last year in Afghanistan bringing them valuable supplies, or bringing them injured back to a hospital where they could receive the care they needed. You see there really are no words to describe exactly how I feel about this day. It is one of those things that you can’t really describe unless you have experienced it yourself. There are so many amazing people who fulfilled their duty in whatever way they were asked that makes it possible for all of us to live our lives the way we want to. The sacrifices made by each of us as individuals varies dramatically depending upon the era in which we served, and the missions which we were called to perform. But, no matter what those sacrifices were we accepted them willingly and performed at our best to ensure that those around us could return home safely, and if that wasn’t possible that at least their sacrifice would mean something in defending the freedoms of those they were fighting for. Joseph Ambrose, an 86-year-old World War I veteran, attends the dedication day parade for the Vietnam Veterans Memorial in 1982. 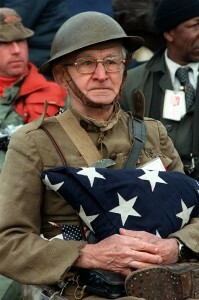 He is holding the flag that covered the casket of his son, who was killed in the Korean War. It is one of the great honors of my life to serve with amazing men and women who have sacrificed so much for people they don’t even know. Veterans Day is a special day for me because it helps me to take a second to stop and think about the legacy that I am leaving behind. We military members have been entrusted with a very solemn legacy that means so much to so many people and it is important to stop and think about that sometimes. The most important part of that legacy is the people themselves who sacrificed so much and asked for absolutely nothing in return. I would encourage you to seek out those that you may know that have served, or are currently serving. Maybe it is a friend, family member, or coworker. Take a moment on this day to thank them, and more importantly ask them about their story. For those who are capable of sharing, ensuring that legacy lives on can be one of the greatest expressions of gratitude that they will ever receive. I would love to hear their stories in the comments below, or through any other means you deem appropriate. As I said before, keeping their story alive is one of the greatest honors we can give them so please help me to do that. Thank you for your support. 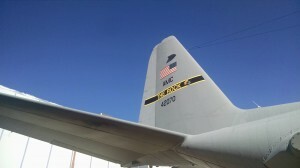 Tail #2070 served her country well for over 40 years. I had a bit of an interesting experience this week that I don’t think most people ever really get. I had the opportunity to be a part of the crew that took a plane on its very last flight. 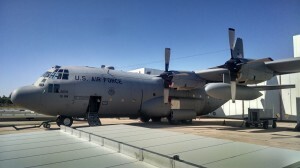 With the development of the C-130J it is quickly replacing the older, and better, C-130H. Yeah, I know, I’m biased. Many of the older planes have gone to National Guard units around the country to finish out their service lives. However, there are a couple of planes that have finished their flying lives and need to be taken to their final resting place. The disappointing part was that none of us knew this was the planes’ last flight, or fini flight, as we like to call them. Had we known I would have come prepared with my good camera and not left you with these weak images from my phone, but I did what I could. It really was an honor for me to crew this plane on its last mission. That aircraft served for 40 years in all corners of the globe performing an incredible variety of missions. I don’t know any specifics, but it is reasonable to assume that it carried Soldiers and Marines to critical missions that brought freedom to people in all different countries. It likely carried young men and women that were injured in battle to a hospital that saved their lives. In the case of those that weren’t so lucky, it likely performed that most sacred mission of returning them to their loved ones draped in the colors that they sacrificed everything for. This tail flash will never fly through the air again, but her legacy will live on in the hearts of those who flew her. It hurts my soul a little to think about these great pieces of machinery having their careers come to an end, but they served their country well, and in the case of this plane, tail #2070, it will continue to serve on the ground for another couple of years. You see, we passed it off to one of the Air Force’s test and evaluation squadrons where it will aid in developing various different products and processes that will make the planes still flying safer and more effective. It really made me stop and think about how cool my job is. I fly a historic plane that has served our country, and many others, for 60 years now. I get paid to fly in the footsteps of real heroes. It is truly a privilege to try in some small way to carry on the heritage that they left us with. While most people will never have the opportunity that I did, nor will I likely ever do it again, we all have the opportunity to keep their heritage alive by visiting aviation museums, and by listening to the stories of those who flew these amazing aircraft. 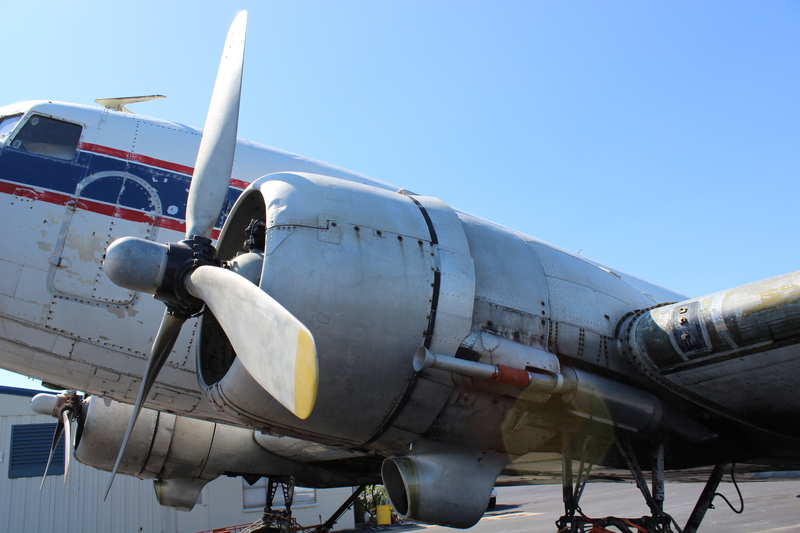 Most of us have at least a little bit of aviation history in our own backyards if we only look. I would encourage you to look around and see what you might find, and please share it with the rest of us because that is the only real way to keep aviation history alive. Living in Arkansas I have often felt like I live in a bit of an aviation void. For a city as large as Little Rock there just isn’t much compared to cities of similar size. We have a small national airport that has Southwest 737s as its biggest commercial client. I work at the Air Force Base so I get more than my fair share of C-130s, and the occasional fighter that zings by on its way to somewhere else, but it is hard to really get excited about much around here. After a little searching I also learned that Beechcraft has a facility here, as well as Dassault which does all of its finishing for its US customers here in Little Rock. I am planning on getting a tour of that facility in January so standby for that. But even with these finds I have still felt a major void when it comes to aviation. Then a few months back I heard about a story on the radio that got my Avgeek senses buzzing. Something about this angle on the DC-3 reminds me of the grandeur that it represents. 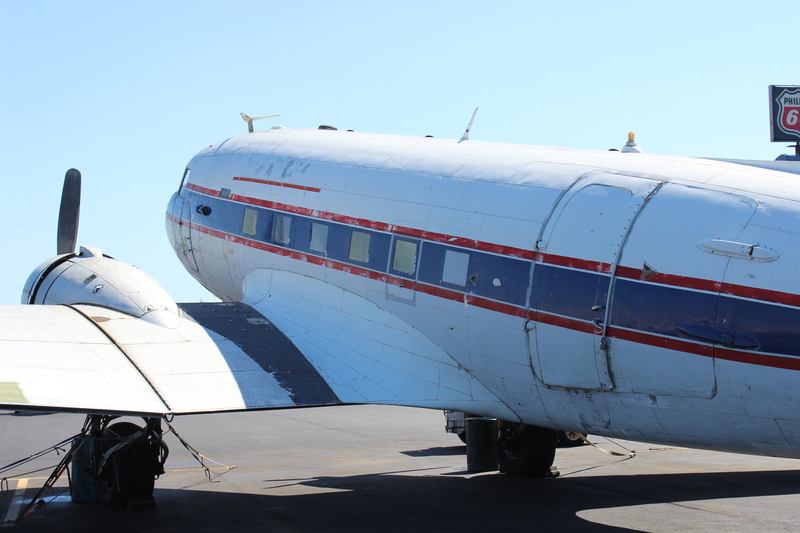 They said there was a DC-3 that was recently purchased by someone at the North Little Rock Airport that they were planning to restore. I was super excited, but then life just got busy and I had to delay my pursuit of what is quickly becoming a favorite of mine. After seeing the beauty that was restored at Historic Flight Foundation I can’t help but love the historic feel of those planes. In many ways they were a gateway from the early days of aviation to the modern age. I was a little concerned that I may not ever get out there because I was scheduled to leave home for a while and wasn’t sure I would have time. But, as any devoted Avgeek would do, I made some time to get out there and get some pictures to compare with later as the work progresses. I took my nuts about planes son and drove out to the airport in search of what can easily become the coolest plane in Arkansas. These engines will obviously get a major overhaul to restore them to their former glory. The North Little Rock Airport sits back off all of the main streets and actually butts right up against an Army base so it took me a little while just to find an entrance, let alone the one I actually was looking for. I finally found what looked like an FBO and pulled in hoping I was in the right place because my son would be pissed if he didn’t get to see some planes like I promised. There is just something about the DC-3 that moves me. We walked inside to find a couple of older gentlemen and a couple of dogs sitting around talking about planes. 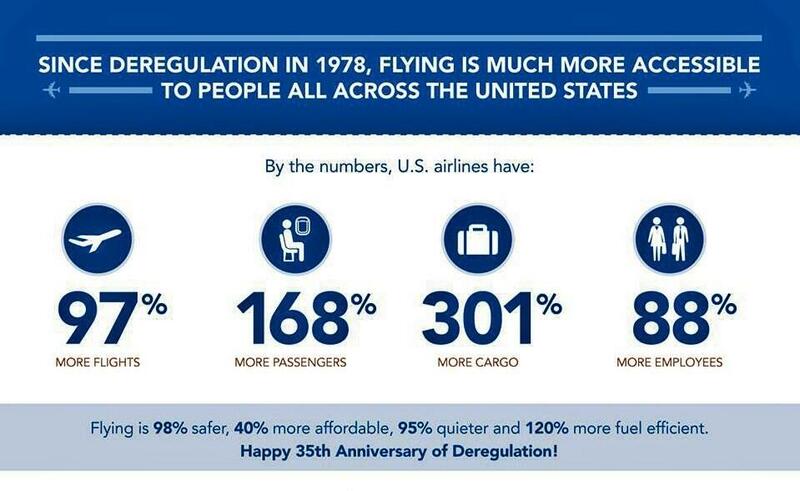 As an aside, that is one of my favorite things about aviation. We aviators, or Avgeeks if you prefer the increasingly popular terminology, can sit around for hours talking about planes and it never gets old, even if it is the same stories. 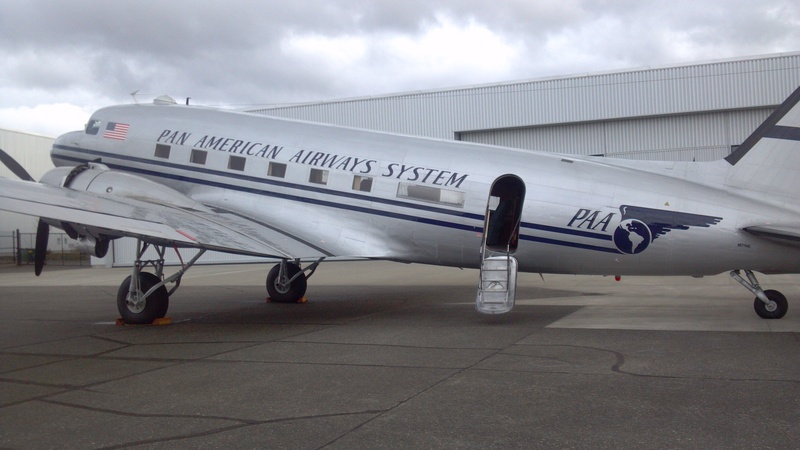 I asked them if this was the place with the DC-3 to which they responded it was much to my delight. By this time my son was already trying to push the door open to get outside so I quickly chased after him with the reassurance that it was perfectly fine for us to go out there. 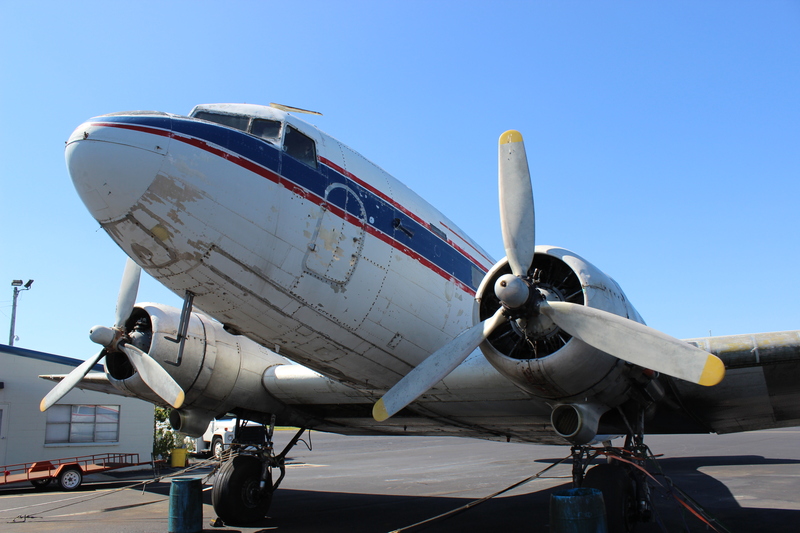 Most of the ramp at Barrett Aviation is scattered with small single engine aircraft, but right in the middle of the ramp is this comparatively massive DC-3 that has more character than you can imagine. 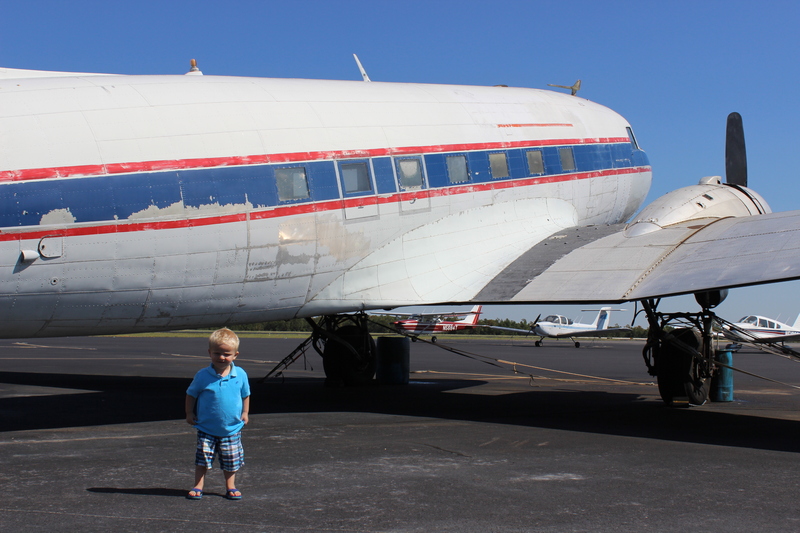 My favorite little #Avgeek growing his love of aviation even more. 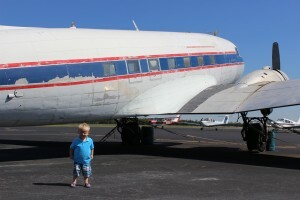 My son and I proceeded to walk around the plane admiring all of its many facets. This plane has clearly been through a lot over its life, and in many ways looked like it was ready to collapse from sheer exhaustion. That being said, it still had a feel of incredible workmanship that had gotten it to this point still mostly in tact. As you can see from the pictures I took, they certainly have their work cut out for them, but I am sure when it is finished it will be restored to all of its former glory. This landing gear has seen better days. Also notice the buckets to catch dripping oil that is all over. It just goes to show you that you can find aviation stories anywhere. What secret gems of aviation have you found in your searching? Please share your stories in the comments below as I would love to hear about it. If you need a little more inspiration to go out and look, stay tuned for something I am writing for a fellow Airplanista’s blog in the near future. Few things give me the chills like the sights and sounds of old aircraft. Shiny new airliners are fun to see, and impressive to admire, but nothing is quite like the simplistic majesty of old aircraft. Every time I talk with friends about winning the lottery and all the stuff we would buy, large amounts of old aircraft are right at the top of my list. 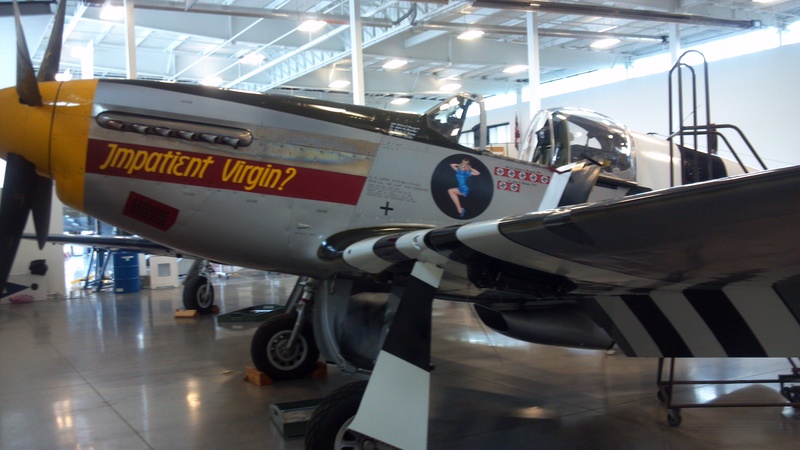 This P-51 Mustang, Impatient Virgin, is just one aircraft that is on display at Historic Flight Foundation. One lucky man is already the owner of just such a collection, though only for a little while longer. Back in June PilotOnline.com reported that Gerald Yagen of Virginia Beach will be selling his collection of old warbirds and closing the Military Aviation Museum due to financial reasons. As one of the largest collections of vintage aircraft in the world I can’t even imagine how much it must cost to maintain all of those planes. 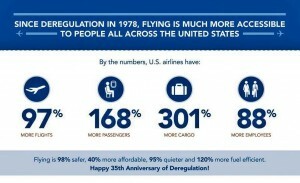 In reading the comments with the article, there is apparently a lot of dispute over what has led to this unfortunate situation, but my only concern at this point is for the planes, and what will happen to them. We have already lost too many of these amazing aircraft, and we can’t afford to lose anymore. As much as all of us avgeeks wish we could pool our money and save these planes, the reality is that that just isn’t going to happen. The most that we can do is hope that the right people buy these planes and maintain this history for as long as possible. 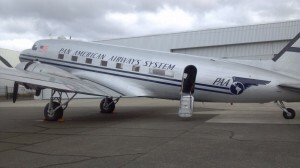 Organizations like Historic Flight Foundation and The Flying Heritage Collection at Paine Field North of Seattle are amazing organizations that due fantastic work in preserving these vital pieces of our nation’s history. 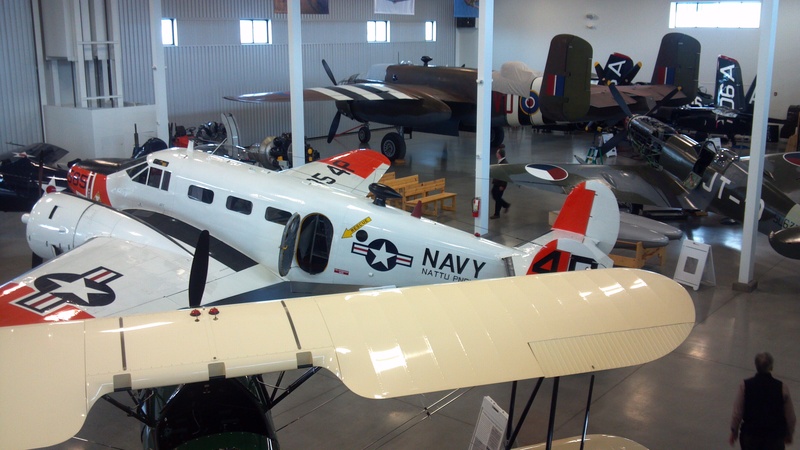 The Legacy Flight Museum in Rexburg, ID is another such group that has committed themselves to maintaining the beautiful history of flight. “Grumpy”, a B-25 bomber at Historic Flight Foundation is one of two B-25s at Paine Field. The other is located across the runway at the Flying Heritage Collection. There are numerous other groups all across the country that are doing their part in keeping these beautiful aircraft in the air, but we must support them through our patronage, and if possible through financial donations. It takes a lot of money to keep these aircraft flying, but even more important than that is the continued interest of regular people so that they know their efforts are appreciated. So the next time you are trying to decide what to do for the weekend get online and find your closest aviation museum. You may be surprised just how many there are. I recently heard about a DC-3 being restored at my local airport, so look for more information on that in the coming weeks. This image, from the Goodfellow AFB website, is from 2007 and shows some of the awards Bud Day received including the Congressional Medal of Honor. We live in a world of mixed up priorities where people are more concerned about the latest crimes committed by entertainers and athletes than they are about people sacrificing their lives for freedom. However, there are still people in this world who sacrificed all so that we could all remain free. We lost one of those hero’s today. Colonel George “Bud” Day passed away today at the age of 88. The New York Times has a great piece about some of this amazing hero’s accomplishments. If you have never heard of Bud Day, than you are clearly not much of an aviation junkie, but that’s okay because you can learn about him now, and learn what it means to be a true hero. Bud Day was a F-100 fighter pilot during the Vietnam War, and was shot down over North Vietnam. He was taken prisoner, and escaped, only to be captured again. For four years he resisted all manner of torture that even the New York Times doesn’t go into great detail about. Suffice it to say that they used every tactic they had to get him to talk, and he never gave them anything but false information. 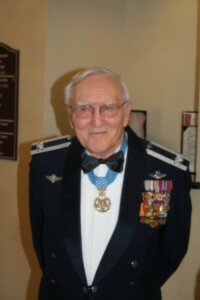 He is one of the most decorated Airmen in history having received more than 70 medals and awards to include the Congressional Medal of Honor. However, his legacy is worth far more than any award could explain. 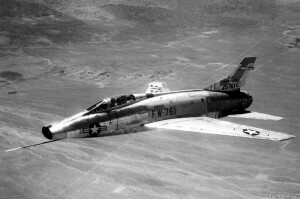 This is a picture of an F-100, the same type of jet Bud Day was flying when he got shot down. anymore, and I agree completely. That being said, I couldn’t help but wonder if great men and women of courage would work their way to the front if we were faced with a similar conflict. But that discussion is for another day. Here’s to one of the true heroes of aviation. You have left a legacy that we can only hope to fill in some small way. You may be gone, but you will never be forgotten. As a member of the Air Force I regularly think about those that went before and left an amazing legacy for me and my contemporaries to follow. They went up against incredible odds flying aircraft that went from inception to production in months, not the decades we see now. On top of that they were actively engaged in conflicts where they were just as likely to die as to come back home. One of my favorite activities is to listen to the stories of these great aviators who paved the way for the rest of us. They have stories of courage and strength that my generation can’t begin to comprehend. For a long time I have thought about how I could possibly honor them, or at the very least ensure that their memory is not lost. There are thousands of these great men and women out there, and every day we lose more of them, and unfortunately many of their stories are lost with them. I haven’t yet determined exactly how I will do it, but my goal is to archive as much of this history as possible in one place online so that others may be inspired by their story. I want to collect stories, pictures, videos, anything that adds to the legacy of these amazing aviators. I really want to collect the history of aviators from all of the major conflicts, as well as the minor ones. I realize many of these great men and women have already died, but I am hoping their family or friends will be able to share their stories as well. I want to collect as much information as possible including campaigns, battles, awards earned, and the other people that were there. If you have something to contribute, I would love to hear about it in the comments with some way to contact you to collect more information. The level of content I want to collect will take a lot more than a short comment, but it is at least a start. I would also love to hear ideas of how I can make this venture successful so that we save as much of this history as possible. Every single one of these people deserve to have their stories preserved. It is not just the famous people who made a difference, but all of them. Please help me to ensure their memory is never forgotten. The Navy’s UCAS-D, X-47B, took another huge step forward in its development today and I had to at least mention it because it is a pretty pivotal day in the future of aviation. I have previously written about the X-47B performing simulated aerial refueling, as well as its first arrested landing on ground, but today it took a major step forward when it performed its very first catapult launch from the deck of an aircraft carrier. Planes have been landing on ship decks for over 100 years, and today the USS George H.W. Bush was the first carrier to see a plane take off without a person actually in it. It really leaves me kind of speechless to think about that. Aviation has always been a breeding ground for innovation, and the Navy has often been heavily involved with that. Personally I thought carriers were the one place we may never see a UAV, but I have definitely been proven wrong. It is interesting how my views on UAVs have changed in less than a year. I wrote that first article about the refueling a little over a year ago, and I was relatively skeptical about where UAVs would actually go, but now I am willing to believe they can do just about anything. 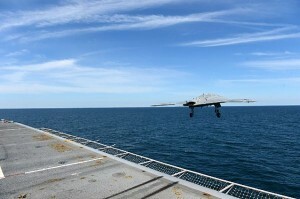 Next up on the agenda for the X-47B is to make an arrested landing on a moving carrier, which they are planning to attempt in the next few weeks.